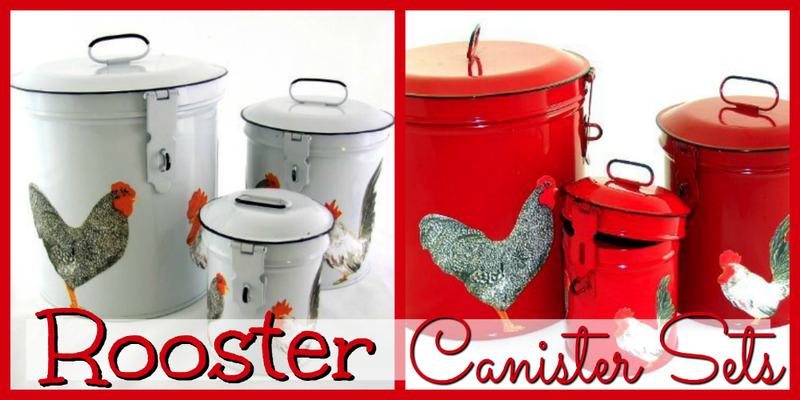 Rooster Canister Sets for Sale Add to Flipboard Magazine. I have been looking for some really cool Rooster Canister Sets for sale because that seems to be the way my kitchen is shaping up. My kitchen used to be all cows, now I am introducing roosters into it. I haven’t decided to go with the bright red ones, I thought the white ones with just a little red would be better for my kitchen. Although, this is a hard decision. 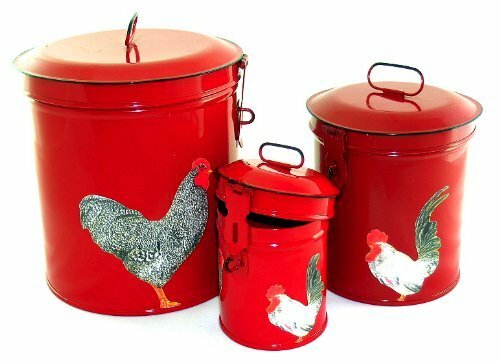 I love the red Rooster Canister Set. Although canisters are designed to be used, some are better as decoration. The ones I have featured here don’t have sealed lids. So I wouldn’t use them for flour or sugar because here in Missouri we tend to get bugs in our flour. I keep mine in a sealed plastic container all year long. 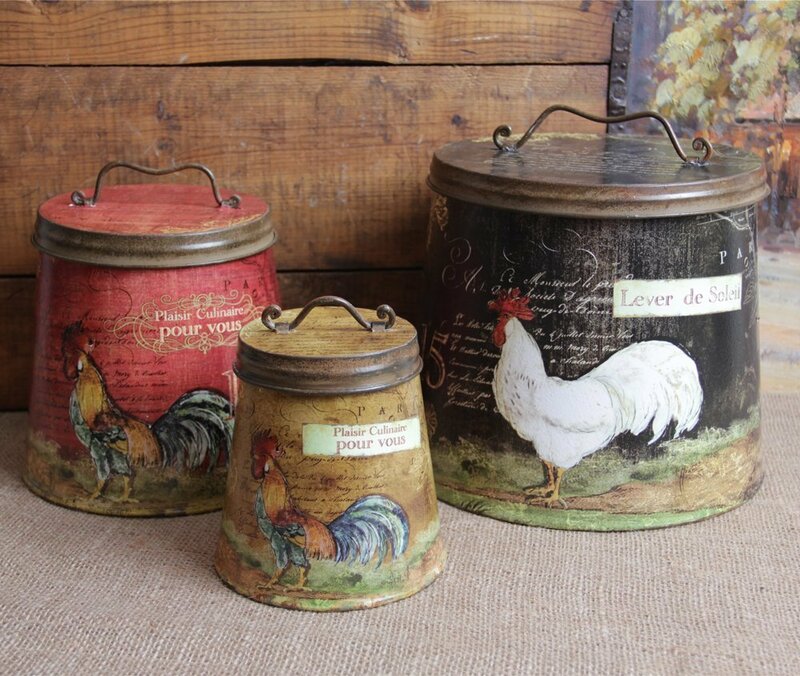 But, these canisters are wonderful to decorate with; especially if you already have a rooster kitchen. I would consider these to be French Country Rooster Rooster Canister Sets. They remind me of what I might have seen on my great grandparents farm. The sizes on these are 4.25″, 6″ & 8″ high. They do have lids, as shown, but they don’t have a rubber seal. I keep my tea in them and my husbands sugar packs. They would add a splash of color that I want in my kitchen. They are just so adorable. Here are my favorite Kitchen Rooster Canister Sets. 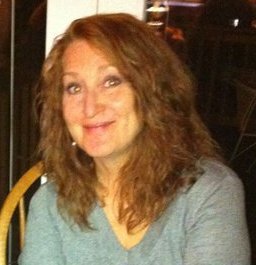 They really have the country kitchen look that many of us are looking for, but they could also be french country as well. There are 3 canisters in the set, all made of tin and have the cutest motifs of roosters and chickens on them. The biggest one stands 8 1/2 inches tall and is 9 3/4 inches around. That is big for a canister. The medium canister is 7 inches tall and the small one is 5 1/2 inches tall. All great sizes to hold your flour, sugar and brown sugar. That is what I usually put in mine. Although, they have lids, but they aren’t sealed lids. 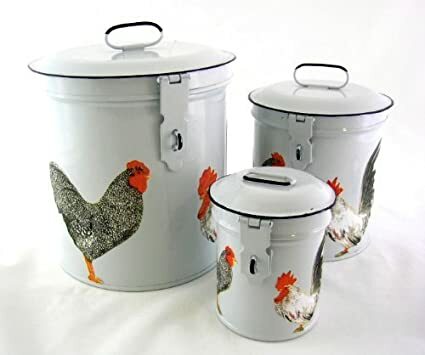 These rooster canisters are big enough that they will be noticed where ever you put them in your kitchen. They will be the focal point of your rooster kitchen. Personally, I would take these right out of the box and put a protective coat over them of polyurethane. I want them to continue looking this nice/rustic for many years.